Originally, I when I decided to add this “form” to the UJT, I just plugged it into the “Words and Such” page because after all it is just a form. But giving it more thought, it literally could mean the difference between life and death. So I thought I would give it the prominence on the main menu that is appropriate. When my wife was getting some Pulmonary Rehab, we leaned that often when emergencies occur the absence of accurate information about an individuals health (i.e. What is normal for this person) and how to find additional information can have a significant effect on their chances of surviving a medical emergency, especially when they cannot talk for themselves. The good folk at the Pulmonary Rehab Center provided a paper form that had been developed to assist first responders in providing appropriate care for a given indiviual and gave it the unfortunate name of, “Vial Of Life (VOL) ” which makes it sound like something you would drink, to me at least. 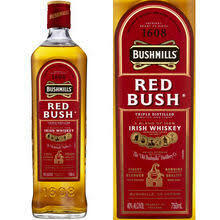 My vial o’ life is currently Bushmill’s Red Bush Irish Whiskey. But I digress. At any rate, don’t let the name confuse you. Get the form, fill out the form, keep it current and located where it can be found when needed and you will live longer. Complete your VOL form and review it with your doctor’s office. I have added links to download Microsoft Word and Adobe PDF versions of this document. Your doctor or nurse or nurse practitioner, may wish to emphasize or deemphasize or clarify some of the information on your completed for given their knowledge of your medical history. Place your VOL in an envelope. Download and cut out the VOL sign. 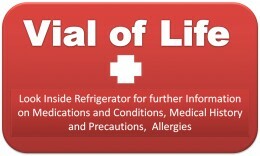 Attach you Vial of Life* to your refrigerator and put the Vial of Life* sign in a window near your front door where Paramedics will look for it when the enter the house. Once completed, this information can save your life in an emergency, if it is accurate and can be brought to bear. Take it with you for updates when you visit your doctor. Note any changes to medications and your diagnosis. Update all copies and note the date of update on the form. Keep a copy on your refrigerator door. First responders have been trained to look there and even an terribly upset spouse who can’t recall specific information in a crisis can remember the information is on the refrigerator door. Keep a copy with your passport, tickets and other travel documentation when you leave for vacation or business trips. Download the Microsofr Word version – MS Word VOL document. Download the Adobe PDF version – San Diego County VOL.pdf.